Congratulations! You have scheduled your first therapy session. Now what? For most people the decision to go to counseling is a very difficult one. Whether it is trying to ‘find the time’, stress about any potential costs of treatment, or fears of what you may or may not get out of the experience; coming in for that intake appointment isn’t always easy. In recognition of this we would like to offer a few recommendations to help the process move forward smoother. After you have completed scheduling your intake appointment at Angelus we will send you an email inviting you to set up your own patient portal. This will include setting up a new password and being able to complete the majority of your opening paperwork online from the comfort of your own home. The patient portal process allows us to get formalities out of the way in order to spend a greater percentage of your intake appointment on you and your needs rather than red tape. We do require this to be completed at least 24 hrs before your appointment so that your therapist has a chance to review your symptom history and needs so that they can to be better prepared for when you come in. While completing this process it is always helpful to put together a list of providers and people we may want to complete releases of information to collect records from or talk to. Whenever possible our office administrator will check your insurance benefits before your appointment to prevent surprises with copays or deductibles. However, there are times where we are not able to obtain this information or what we are able to access not current or fully up to date. It is always recommended for you to double check with your insurance company about your coverage for services. If you have a deductible or copay, you will be responsible for it the day of your appointment. For your convenience we do have a credit card feature in the patient portal where you can store your information to have your card charged automatically at the end of each session. In the event that an unplanned deductible amount comes back or your insurance denies coverage for your services you will be responsible for the full treatment cost. 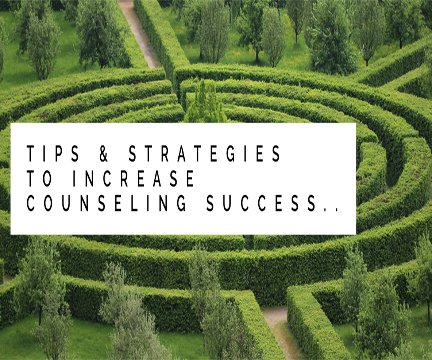 There are many reasons and paths leading people to seek out counseling. Feelings of unhappiness, a recent loss or trauma, or a long term struggle with relationships or addictions can be trigger events. Before your session, put some thought into what you want to get out of the process. Sometimes we phrase this as a miracle question “if you could go to sleep tonight and a miracle could happen to solve some of the problems leading you into counseling, what would look different when you wake up tomorrow?” Pull out a notebook and write down some thoughts, fears and feelings. Don’t worry about it being clear, or making perfect sense; you are just brainstorming your struggles. Bring that notebook in with you for your appointment so that your therapist can get a better idea of where you are at and where you want to go. Coming into treatment is not a weakness or a sign of craziness, but many people worry that it will be interpreted that way. It is actually a great strength and something to be proud of. Insanity has been defined as ‘doing the same things over and over again and expecting different results”. By coming in for treatment you are breaking that loop and starting something new. Pulling towards a better sense of balance and control. Allow yourself to be fully present at your appointment. Plan to arrive for your appointment 10-15 min early to prevent any traffic issues or other circumstances that may contribute to you being late or missing your appointment. Shut off outside distractions while you are in your therapist’s office. Turn your phone off or leave it in your car. A ringing phone or the vibrating indicators of a waiting text message or social media post is a BIG distraction and pulls you out of the therapy process. Take steps to prevent this from happening will help you get the most of your experience. We even suggest taking off your ‘smart watches’ if they give you notifications of calls, texts or emails while you are in your appointment. Baring a severe life circumstance there is nothing that can’t wait the one hour until your appointment is over. We will fully dedicate our time to you and ask you do the same. Be as honest as possible; don’t be afraid to speak up. Therapy is one of those things where you will get out of it what you put into it. If you repress thoughts, feelings or fears, your therapist may not be able to help you travel down the right path. Everyone connects and learns differently. If you feel something is off in the therapy process, SPEAK UP, let the therapist know what you are thinking or feeling. Most of the time this can be easily worked through. Our therapists are trained in multiple modalities. Each a little different from the other, your honest feedback as to what is and is not helpful will drive treatment to better meet your needs. One of the barriers in counseling is telling your therapist what YOU think THEY want to hear rather then what YOU are ACTUALLY experiencing. You will not upset or disappoint them, they WANT to hear your voice and truly help you get what you need. It’s not about THEM, it’s about YOU and what you need. That’s why they are here. When a therapist is not the ‘right’ fit for you and your needs we never take that as an offense and we will do whatever we can to find the approach or therapist that is can meet your needs. Therapy is a process; it is not a quick fix. In most situations it took a long time to get to where you are now, it will take time to help you get to where you want to go. The first several sessions typically focus on getting building connection in therapy and developing a strong plan for treatment. On average a person will be seen for 6-8 sessions before feeling they are making forward momentum. This is normal. You are resetting patterns and processing difficult events. They will work towards helping you build coping skills and strategies typically before processing any intense issues to better prepare you for the emotions of this. If in the process of preparing for your first appointment if you have any questions please feel free to reach out to us by phone or email and we would be happy to discuss any concerns. We genuinely look forward to working with you! These are really helpful tips and things to “do” to feel proactive and productive while waiting for your appointment day to arrive.